A €12 million annual trade in illegal bluefin tuna recently uncovered in the Mediterranean and the dramatic overfishing of tropical tunas, pushing populations at risk of collapse, underline the need for serious action by the EU and tuna fishing nations at the ICCAT meeting in Croatia, starting on Monday 12 November. Dubrovnik, Croatia - A €12 million annual trade in illegal bluefin tuna recently uncovered in the Mediterranean and the dramatic overfishing of tropical tunas, pushing populations at risk of collapse, underline the need for serious action by the EU and tuna fishing nations at the ICCAT meeting in Croatia, starting on Monday 12 November. WWF urges the EU and other fishing nations to put in place stringent controls and sanctions against fraudulent companies to dismantle illegal trade before deciding on any future fishing quota increase. Failure to do this, or changes in the current plan, could threaten the recovery of tuna species. This year the debate is expected to be strongly influenced by the ongoing criminal investigation of the suspected laundering of €12 million of undeclared Mediterranean tuna allegedly involving Spanish companies, French and Italian ports, and Maltese bluefin tuna farms. If confirmed, the enquiry would reveal that every year, 2,500 tonnes of bluefin, corresponding to almost 20 per cent of last year’s quota for the whole EU, have been able to escape the controls of the EU and member states. “The fact that tonnes of unreported bluefin tuna could have been smuggled for years across EU borders is simply unacceptable. The EU and all fishing nations must close the loopholes of our control and monitoring systems and start cracking down on criminals by blacklisting vessels, withdrawing fishing and farming licenses and imposing effective sanctions. Any increase in fishing quotas or changes in the recovery plan must be put on hold until we have a full record of the tuna that is really caught from the sea,” said Alessandro Buzzi, Bluefin Tuna Regional Manager, WWF Mediterranean Marine Initiative. Last year, WWF criticized ICCAT’s decision to set the highest quota increase of bluefin catches - up to 36,000 tonnes - by 2020. Considering the scale of unreported catches the ongoing criminal investigation points toward, such an increase could gravely undermine the efforts undertaken in the last decade to bring the highly threatened species to full recovery. 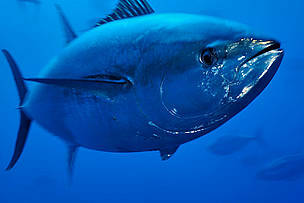 WWF is also seriously concerned about the high level of overfishing of tropical tunas that risks collapsing the stock by 2033 according to scientists. In the last two years, catches of bigeye tuna were 20 per cent higher than what was agreed in the ICCAT recovery plan. Catch limits have also been regularly overshot for yellowfin tuna, threatening the health of the stock. In 2016, around 150,000 tonnes of yellowfin were caught, a level estimated to be 36 per cent above the legal quota. WWF is also asking ICCAT for a stronger ban on shark finning, already put in place by other institutions including the EU, and that causes the death of millions of sharks every year. Deprived of their fins, sharks are discarded back to the sea, often still alive, but unable to swim effectively so they sink and die. In addition to this, in the Mediterranean, WWF is calling for strong management measures to avoid shark bycatch through measures including gear restrictions and fishing closures. WWF also believes ICCAT should ban the retention of North Atlantic shortfin mako shark and limit fishing quotas for blue sharks in line with scientific advice, to avoid overfishing. A captive Atlantic bluefin tuna (Thunnus thynnus), Malta, Mediteranean.